The long-awaited Morris Graves: His Houses, His Gardens tells the story of the homes of Morris Graves, a leading figure in Northwest Art and one of the most important American artists of the twentieth century. This high-quality book with beautiful duotone photographs concerns itself with four locations—The Rock, Careläden, Woodtown Manor, and The Lake. 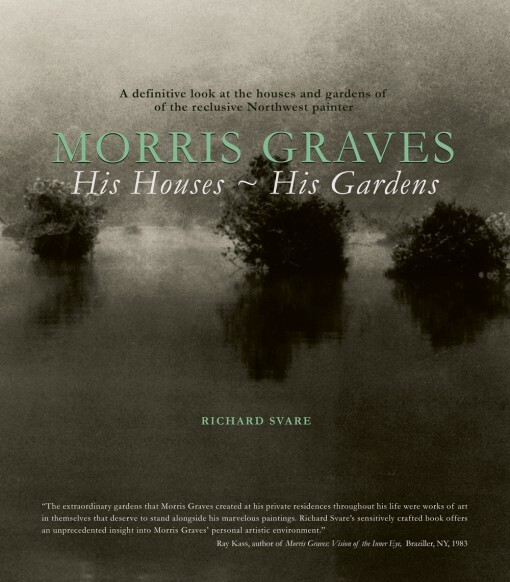 Author, photographer, and close Graves friend Richard Svare makes clear that the world Morris Graves inhabited physically was the world he experienced transcendentally. As a charismatic figure who traveled extensively throughout Europe and Asia, Graves developed friendships with artists like John Cage and Merce Cunningham, and hobnobbed with celebrities and royalty. Throughout his career, Graves’s work is represented in many public and private collections, including The Museum of Modern Art and Whitney Museum, Washington’s Phillips Collection, and the Los Angeles County Museum of Art. Partly because he chose to live in the Northwest, Graves was often said to be reclusive. Many of his early paintings were created at “The Rock,” a cabin he built for himself eighty-five miles north of Seattle. He built a home in Ireland and spent the last thirty-five years of his life in Northern California.